It did. Only this time it wasn't empty . . I haven't read any of Brooks' other book before, but a fellow Book Seller recommended this to me while we were looking for possible Book Club books. I think that this would make an excellent choice for the Book Club! It would give us a lot to talk about. There are many ideas explored in this book that would make for great conversation and debate. Saying that though, I would be reluctant to recommend it to the younger end of the YA market; as there is a fair amount of swearing in it, and the concept itself can at times be a little unsettling. I loved the style of the writing. It, as the name suggests, is written in diary form. 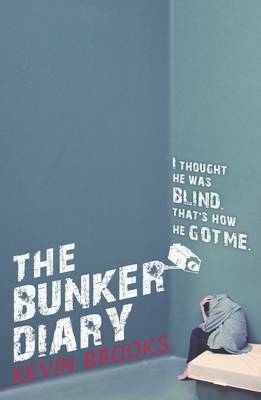 We learn about what's happening in the bunker through Linus's stream of consciousness style diary entries. It is very one sided, but I loved that about it. We come to know Linus, and the other characters through his eyes and observations. We learn of his past and how he came to be in the bunker. It is an emotional book, and it had me sobbing and laughing both. It is not a new concept for a story, but I loved the way it was told and how connected to I felt. I could imagine everything clearly as if I were watching it as a movie. It would make a brilliant movie actually! Ahhhh! There is so much that I want to tell you about this book, but I don't want to spoil it for you, so I won't! :p What I can say though is that if there is one book you have to read read this year, it's this one! It's not out until 7th March, but please, please get your self a copy ASAP! You won't regret it.